Traditional Witchcraft is a term subject for a series of misconceptions that in fact stems from the term itself. For one, the whole idea of witchcraft is a category immensely wide across history and geography and counts a whole array of concubines, prisoners, astrologers, beautiful women, seedy people, criminals, heretics and so forth. It is a pejorative term denoting what defies civic social order and boundaries. 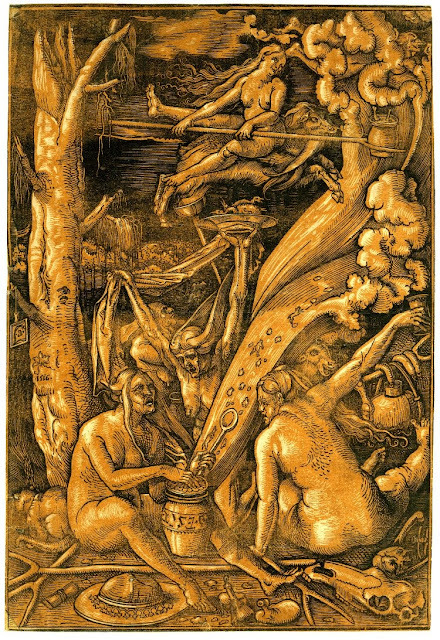 This means the whole idea of ‘the witch’ is a term developed by the profane social order and as such it is only natural that the idea of the witches’ craft invites equally invites those who desire to restore the intent at the heart of the matter as much as lost souls living in alienation of the Craft that seek to impose their gospel upon the witches’ Craft. Given the diversity the word itself have been subject for it is only natural and true that the Craft is subject to diversity in faith and rite – but this never changes the doctrine at its root. This complex origin also result in the accusations of elitism directed towards the few traditional Craft groups that have chosen to show a public face for some time. This elitism is often understood on modern premises which defines an ‘elite’ as being someone superior, while it is simply about those elected by blood and ancestry. This does not impose a polarity of superiority and inferiority on any one but one of kin and not-kin. The fact that you can never request to enter a closed clan – but rather be invited upon recognition of shared blood, provokes some due to an unfortunate sense of inferiority. From this complex of inferiority and desire veiled in alienation we see creatures crawling out from their holes in rotten wood preaching some weird gospels. They want to make federations and they want to gather followers – all in the name of inferiority and injustice – albeit the gospel sounds different in the words covering the complexes they are exercising. The Craft proper can take many forms, from solitary ways, to adopt a form of guild or order into apprentice, journeyman and master and also be one of clanship. At the heart of the Craft we still find the mystery that connects it all – it is about the land made fertile by the stars and angels with all its implications. It is in this simple and grand mystery that stretches to the centre of earth as much as to the immovable point in the heavens we find the Craft – and herein is found the explanation of diversity. Land and sphere behaves in ways different from region to region as they did across time. In this we find the fluidity of the Craft, how the One Mystery has a thousand ways. The Craft follows the silent laws of Nature – not society or the civic order. It speaks from the grandeur of the Land and the many wise ones that gave their blood, bones and flesh to the land. The Craft speaks in the voice of land, wilderness, angels and ancestors – and how can this language ever be ‘human’ – it naturally speaks with your soul and shakes your heart! I believe many modern delusions concerning the craft arises from our civic order that insists on manmade and worldly values. Seekers, lost in this assault upon nature will feel even more lost and their alienation will be painfully evident as they try to call the spirits of a land now covered in asphalt, concrete and glass. A garden gives solace in this alienation – and if you tend the garden well land and spirits will speak with you– but in the want of even this little piece of blessed land man is at a loss with the Craft proper. I have stated through my book Arts of the Night (Chadezoad/Lulu)/Artes da Noite (Rosa Vermelha) that the witch is a poetic imagery of a legacy that pertains to us all – and I believe this to be so very true. This legacy however speaks through land and spirit and as it was then it is now. We need to search this legacy at springs and groves, in caves and wilderness. It is here in the wilder domains of Nature this legacy is found – not in federations, social and nefarious condemnation and exaltation or in quarrels of beliefs. The Craft is about the pure voice of nature as she speaks to the blood and quickens you to be wise in finding your peace.